Bob Gallagher is all smiles with “The Biggest Almanor Brown reported in this season. This fish hit a trailer crawler, stacked above a Seps Strike Master Dodger, between the A-Frame and Rec. 1 Down rigged at 25 ft. at 1.2 mph. 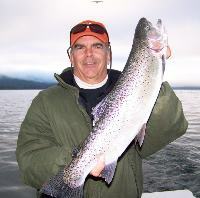 and covered in Pro-Cure Trophy Trout. Pictured again is: Bob Gallagher. 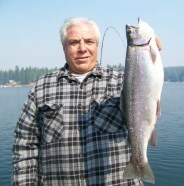 Bob also caught this Big Rainbow, on the east shore that was just under 5 lbs. and hit the same rig. 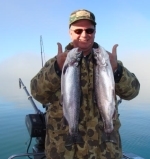 Both of these are BIG FISH....and Bob went on to have a great day, limiting out. Its Awesome, and I don’t use that word often. The effects of a early spring are happening. A amazing amount of insect hatches along the east shore have drawn in fish. Actually the whole lake is sending aquatic insects out of the muddy lake bottom. We been working the Dorado and nearby Lake Cove. Fish are rising on the east side as we motor over from Rec.1. 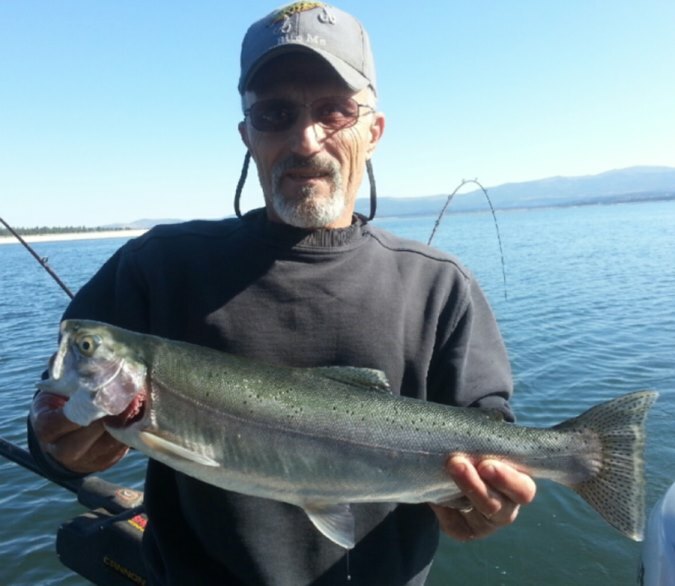 We did fairly well on the east shore this week catching a mix of average to above average fish. 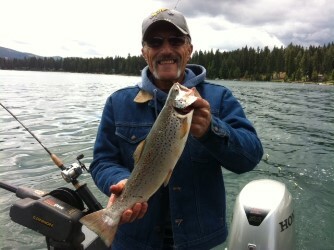 Mostly Browns, Rainbows, and at least one King every day we been out, along with a few LDR,s, and one pump wonders. Rec. 1 to Big Cove, lots of fish are in this popular trolling lane, and nobody was there yesterday. We made a couple passes picking up a couple Browns and marking loads of fish. One of which was a Big 9 pounder, this massive brute has 30.5 inches long. 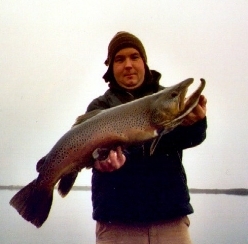 Believe me “it was a battle on ultra light tackle just getting this fish in.” While the east shore has been kicking out some nice fish, the Rec 1 area to A-Frame would be a great place to start. Loads of fish, and not as many insect hatching as the east side. 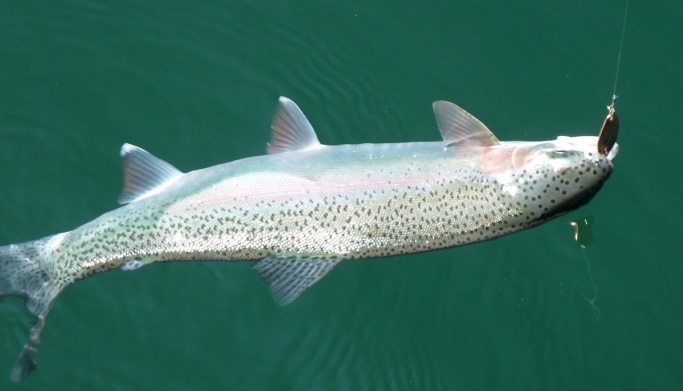 I feel, that when you get a lot of fish in a area, and not enough food available, they are hungrier and attack more aggressively. Throughout the week we been changing rigs. 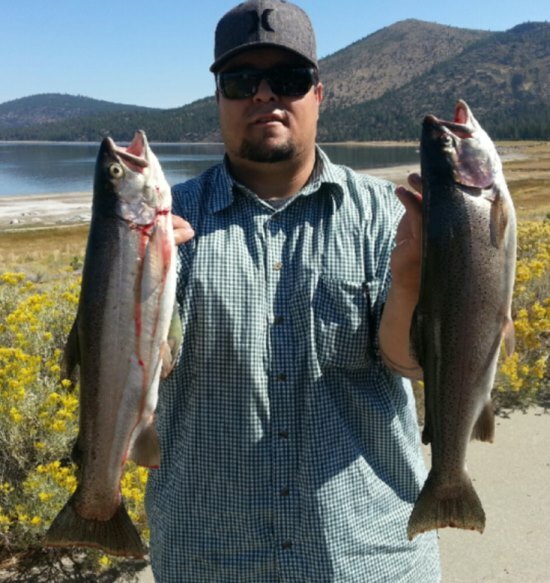 One day fish are chasing fast action, and the next day they are after the dodger crawlers rigs. Be prepared to do both. While fishing pressure has been on the light side, there was some radio traffic on Chl. 69, and not every boat was doing as well as they would like. So if your not getting hits, switch out. Strike Master Dodger strikes again!! 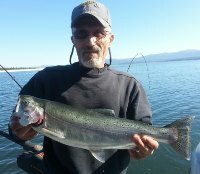 From Doug Neil's Weekly Fishing Report..."Trolling Speedy Shiners at 2.5 mph at 25 to 40 ft. down got us a few fish in the 2 lb. class but the hits were far and few between. Switching back to the Strike Master chartreuse dodger crawler combos and slowing down to a 1.2 to 1.5 mph and the tempo really picked up." 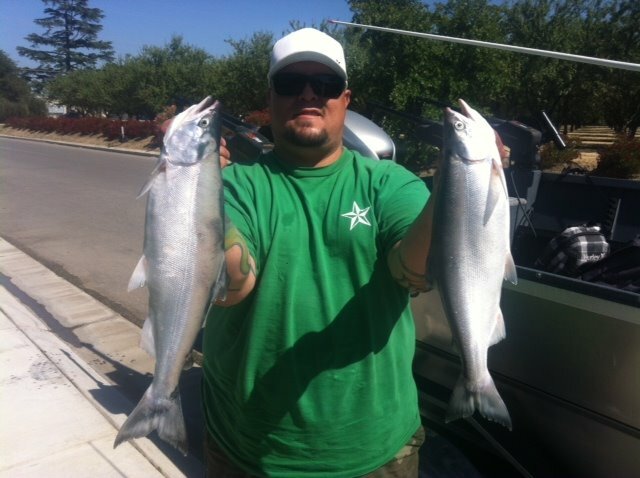 Photo courtesy of Doug Neil of Alamanor Fishing Adventures. "Fish For A Wish" was a great turnout. AJ, at Big Cove Marina, said it looks like a new record amount of money was raised to help kids with life threating illnesses. Thank you, to all that showed support for this event, especially Dana atSep's Pro Fishing and those that just sent in a few bucks. 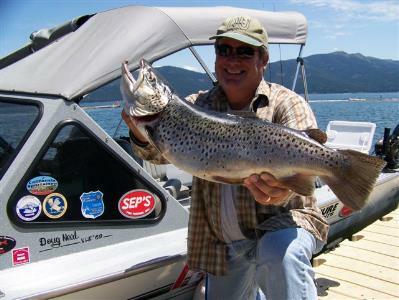 As it turned out my boat, the “Almanor King” featuring the, ‘Sep's Pro Fishing Team”, of myself and Rod Overstreet (AKA..Easystreet) took 1stplace for the "Fish for a Wish Tournament". 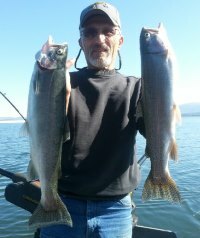 Also, 1st place for “Biggest Salmon and 2nd place for biggest Trout..
How did we do it?..Well I been telling you for 6 months.. ”Sep's Strike Master Dodgers” with 1/2 a crawler, and Pro-Cure Trophy Trout Scent have been catching fish that just seem to be consistently bigger than the next guys..
Pictured is: Rod Overstreet with the fish that checked in at 4.2 lbs., Mario with 2 limits of Kings and Yours truly, feeling the glow of winning in another event. 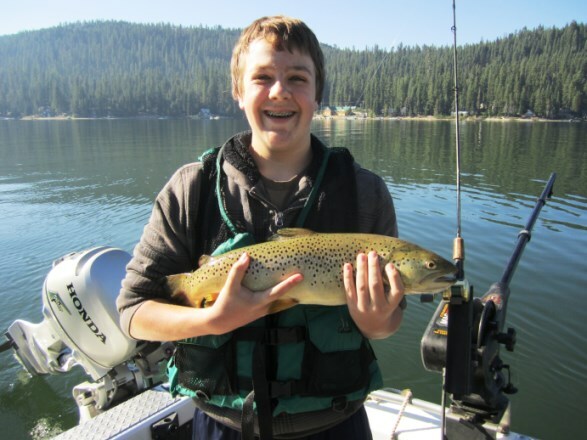 My son Austin Erch and the 5lb, 10oz, 22.5" Brown trout caught at Buck's Lake on 7/12/12. He was trolling a Sep's Kokanee Kandy trailing a Sep's Watermelon Dodger at 27 feet. Notice in the second picture the mangled hooks...one is nearly pulled straight and the other is kinked. 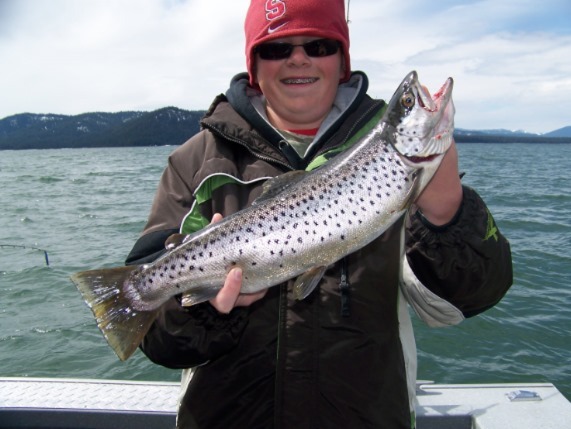 A fish of a lifetime for a 14 year old ! I haven't caught a fish tht nice yet, I'm sure glad he was in my boat when he did! 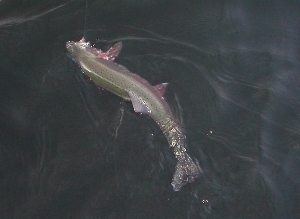 The fish was photographed and released. Nice stringer from Bridgeport Reservoir with guide Ken Hoffman. 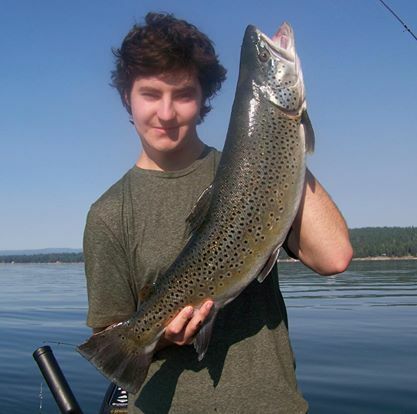 A nice July 13th, Lake Ross catch on a Sep's Strike Master. 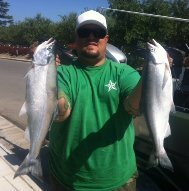 Dustin 6/12/12 Lake Berryessa Kokanee caught using a Sep's Copper\Purple Pro Dodger and Purple\Blue Kokanee Kandy tipped with vanilla corn. Well I put that Chartreuse Prism Strike Master Dodger to work today. 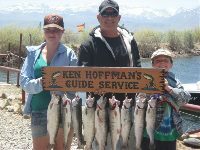 (06/06/12) We caught several 2 year old Kings and Rainbows.. and the biggest Brown of the season..Last week we got a 5.5 lb.Brown..
Today we got a 5.13 oz. hook jaw. 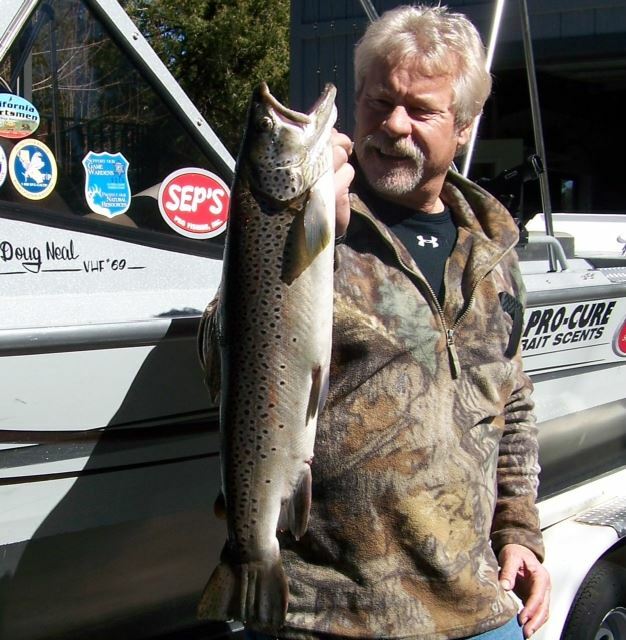 All the biggest Browns have come off Stike Master Dodgers...going back last year too! 05/13/12 - Three trophy trout from Shaver Lake, Ca. Used a 4/0 - Gold/Chartruese Tire Trak UV and a UV Banana. There are no others that I will use, Sep's dodgers always put fish in the boat. 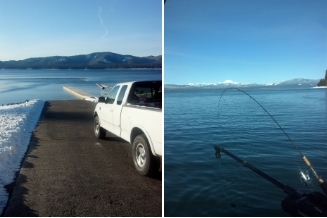 04/18/12 - “Prime Time at Almanor” It's on Boys and girls! If you've been waiting for things to improve, that time has passed. 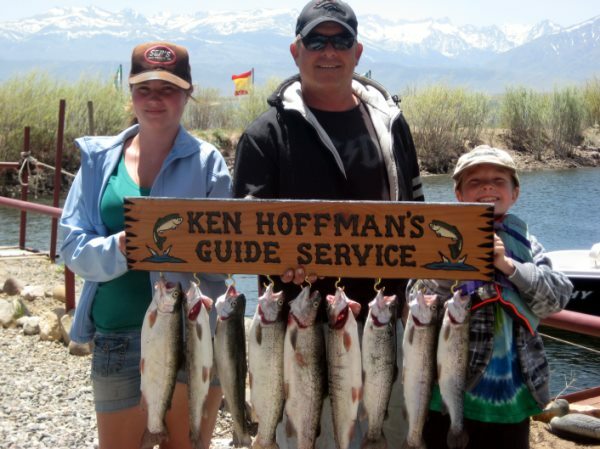 Gas up the boat and head for Canyon Dam ramp. Pack a sandwich and a bottle of barley pop. 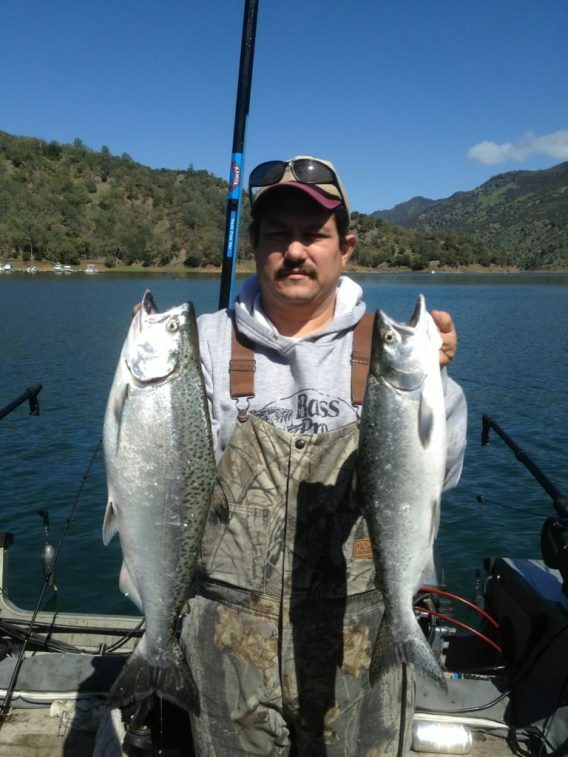 April 2012 - Lake Berryessa Kings! Caught rolling shad and anchovies from 95-140' deep around the dam. 03/09/12 -- We released several Rainbows today and then BA BAM....holy guacamole. The Chartreuse Prism Strike Master/threaded crawler with Pro Cure Trophy Trout scent.. Nailed this 7 lb. Brown along the East side of the Almanor Peninsula. and you can launch. At 8am on March 2nd, the temperature was 18 degrees and raising. "BEST OF THE WEST" Award Winners! 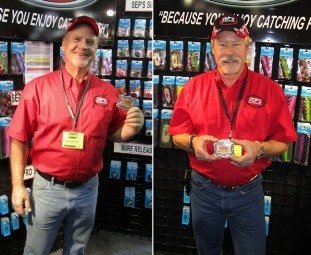 SEP'S Pro Fishing Pro Staff members Dale Daneman and Doug Neil were awarded ISE's "Best of the West" award over the recent 4 day event. This award, a silver and gold belt buckle, was presented to each of them because of all the presenters at the California Sportsman's Theatre, Doug and Dale, through their individual seminars, have continuously, year after year, educated and informed anglers with standing room only seminars. Their seminars have repeatedly packed the house and the content and value of their seminars earned them this honor. 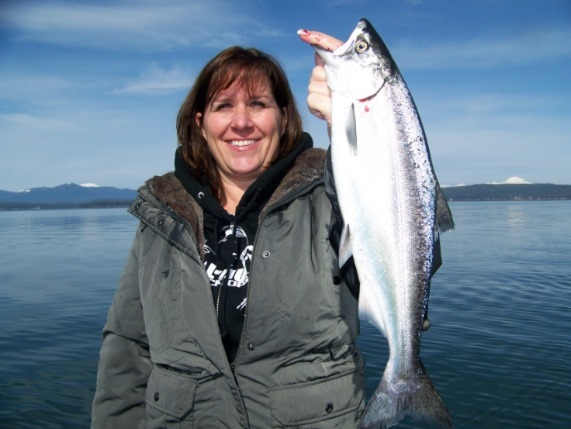 We honor their acheivement and thank them for their continued support in SEP'S Pro Fishing booth year after year of volunteer service to SEP'S Pro Fishing and the angler community. 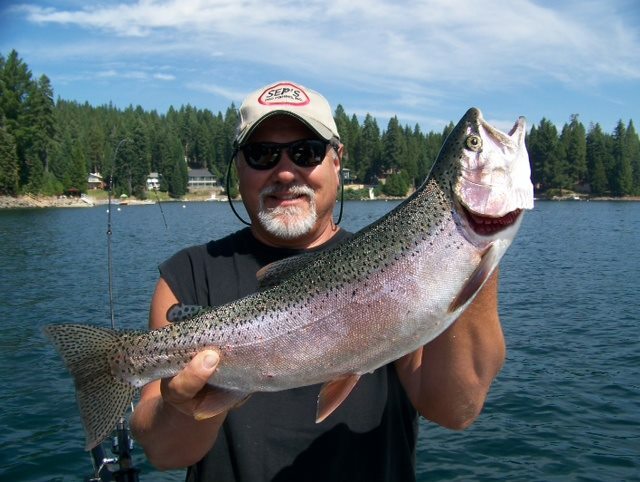 Hop on board with Dale Daneman of Dale's Foothill Fishing or Doug Neil of Almanor Fishing Adventures for a fishing adventure you will never forget! Who Knew...Seps was for stripers too! My wife and I troll a majority of the time at Diamond Valley Lake in Southern California. Our trolling set-up always includes Seps Pro Fishing Pro Dodgers or Strike Masters. This time, we experimented with an unusual combination that I heard was working for the big stripers. I set-up one of our lines with the 4/0 Pro Dodger in the Silver/Silver Prism, followed by (2) Seps white trolling flies at different leader lengths. We had really good luck on this presentation. At one time, my wife got a double hook-up on this set-up. 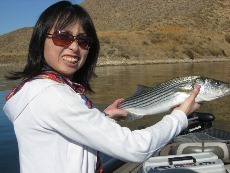 The short leader with the trolling fly got bit off by a huge striper probably in the 12-15lb range. 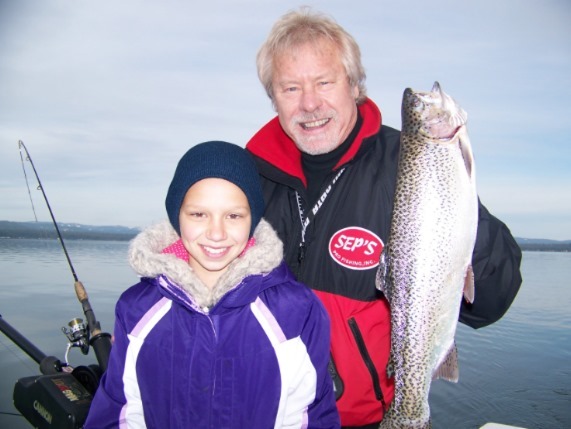 We’re always impressed with the versatility of Seps Pro Fishing gear. I always keep a good supply in my tackle box and make sure that as we hit the water, our trolling rigs include Seps gear! Thanks Dana for your innovative products and great customer service. B. Ogawa, Tournament Director-Striper King Classic, Diamond Valley Lake. 07/22/11 - Joe Rizzo landed this 16 lb., 34" Mackinaw from Caples Lake south shore near the rocks at a depth of only 5 feet. Joe used a SEP'S copper /orange tire trak 4/0 dodger trailed by a crawler. Doug Neal placed 2nd & Rod Overstreet placed 4th in the recent "Make A Wish" tournament at Lake Almanor using SEP'S Strike Master rigged the way Doug likes. Everyone had a lot a fun while raising over 65K for the "Make A Wish" foundation. 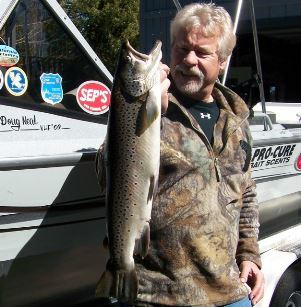 Ok, Offical weight was 13.2 lbs..
Sep's 50/50 Strike Master with a threaded crawler 18" injected Pro-Cure Trophy Trout secent... rigged down 25 ft and only 35 ft. back took this 13.2 lb. 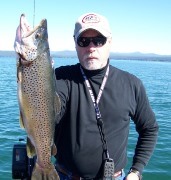 Brown Trout from Lake Almanor. It took 2 hrs and 2 minutes to get this fish in, he was powerful. We moved with him over 600 yds of water. 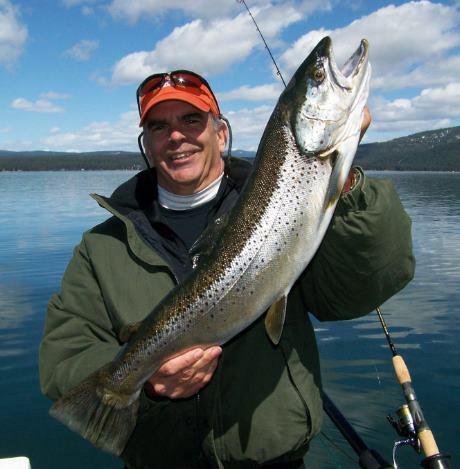 Ultralight and whatta fight!" How to rig your presentation with the Strike Master. 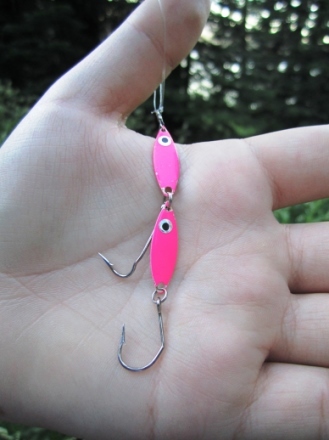 The current world Light Tackle (4 lb. 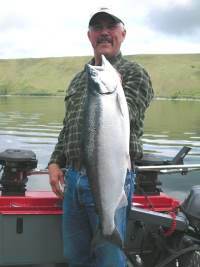 test class) kokanee record was broken in June 2011 by Brian Russell at Wallowa Lake. 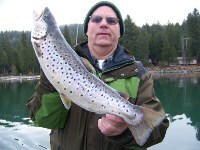 The new world record fish was 26 inches, 7 lbs. 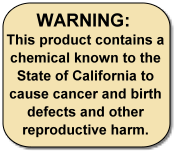 8 oz... 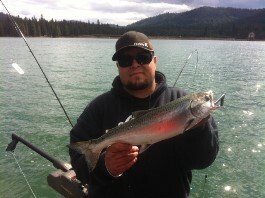 He caught this monster "Koke" on Sep's Pro Fishing 4/0 Watermelon UV Dodger and a home made spinner. All I can say is, I wish it was me and congratulations on the fish of a life time! 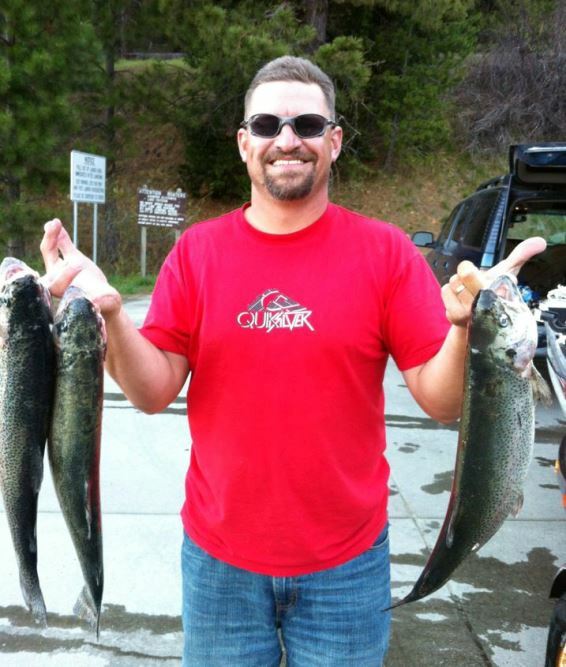 "It couldn't have happened to a better guy, Brian is one of the most humble fishermen that I know and also one of the best kokanee fishermen here in Oregon. I must say, he has earned this one."